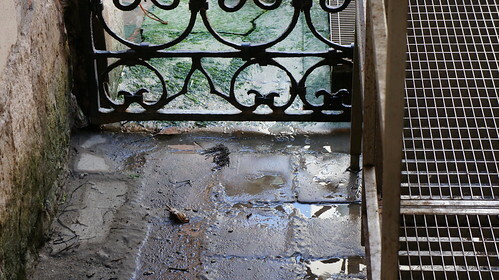 Awakened in the early morning by a thunderstorm, the first and only instance of inclement weather we experience in Venice. Lightning flashes outside, and a few drops of water come into the hotel room through the open window; nothing worth closing it for. On second waking, the rain is over. The canal outside is bright green. Complimentary breakfast at Ristorante Ribot is a simple affair of rolls and croissants with thinly sliced Italian ham and coffee and juice. 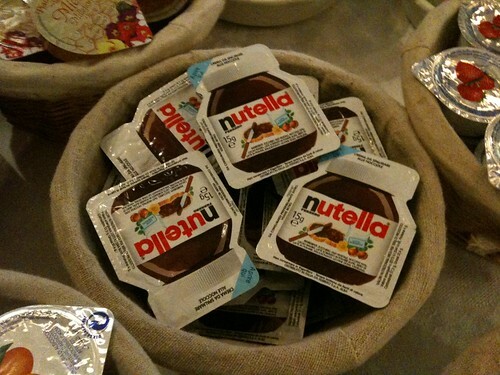 I discover the joy of Nutella. 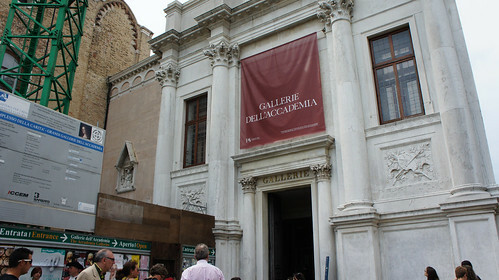 Walk to the Gallerie dell’Accademia is faster and easier than expected, thanks to the yellow signs everywhere pointing the way to major Venetian landmarks. 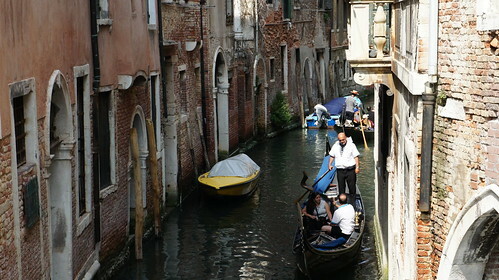 The winding route through Sestiere Dorsoduro takes us over canals and through narrow alleys and past countless costume and “paint your own mask” shops. 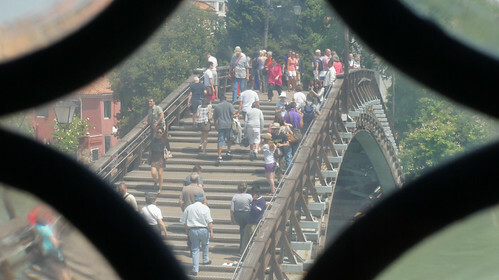 At one point we pass over the Ponte Vinani, more infamously known as “Ponte Delle Gomme” for the sotoportego on one side of the bridge where passersby used to stick their used chewing gum. 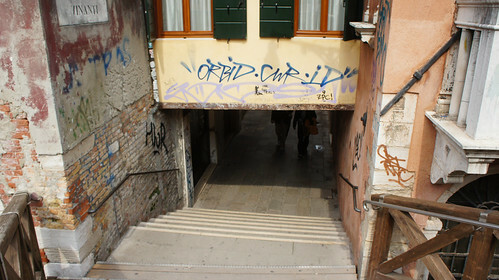 At the time we pass under it, the sotoportego has been cleaned of gum, but not graffiti. 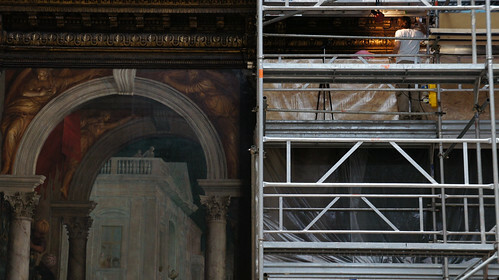 Much of the front of the Gallerie dell’Accademia is wrapped in scaffolding. While in line for tickets inside we notice a poster for a Canaletto exhibit at Palazzo Grimani and decide to check that out after the Accademia. 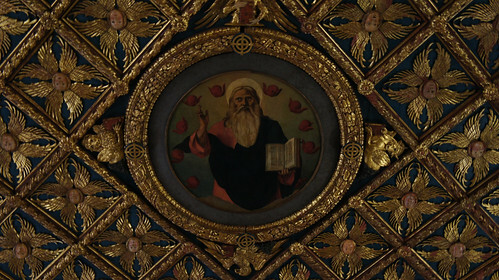 The better part of the morning and early afternoon are spent viewing 14th to 19th Century Venetian art. I love the ceiling paintings in the Sala dell’Assunta, the hipsteriffic fashion of Sebastiano del Piombo’s Santo Sinibaldo, the drowning knight in Andrea Previtali’s Passagio del Mar Rosso, the cows breathing on the infant Christ in Il presepe e l’annuncio ai pastori, the horse seeming to grin in Giovanni Mansueti’s San Marco risana Aniano, and of course all the Titians and Tintorettos and Canalettos and so many other historic artists it still brings tears to my eyes to think of all their paintings. In the gallery that was formerly the Church of Santa Maria della Carita, windows with those ubiquitous round Venetian panes afford nice, slightly fuzzy views of the Grand Canal and the Ponte dell’Accademia. It is all over too soon. 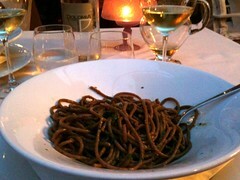 We leave Accademia and hunt for lunch, specifically a restaurant recommended by a friend at church, Al Casin dei Nobili. After much wandering about, we find the place — but it is closed on Thursdays, and today is Thursday. We get lost again trying to get back to the Ponte Dell’Accademia, and we tarry at a traghetto stop, wondering if we can ride one of these retooled public transit gondolas across the Grand Canal to Campo San Samuele, but no traghettos appear to be serving the stop. The delay isn’t a total loss, as we find an interesting tunnel along the way, and plushies drying on a line, and a painting pigments store. Finally we make our way back to the Ponte dell’Accademia and cross over to Campo Santo Stefano, then turn down the Calle Delle Botteghe till we arrive at Osteria Alle Botteghe, which some travel guide on my iPad says has some good food. 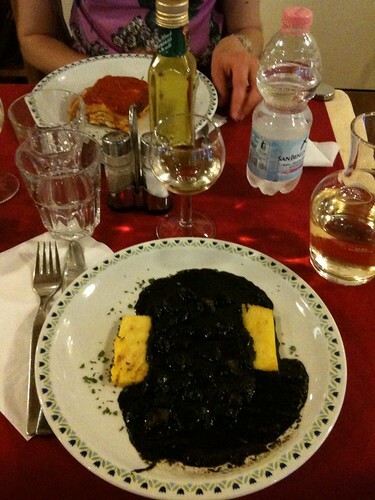 And indeed, the Seppie Nere Alla Veneziana (Venetian cuttlefish with ink) is one of the best things I have ever eaten, and Amy’s lasagna is glorious. 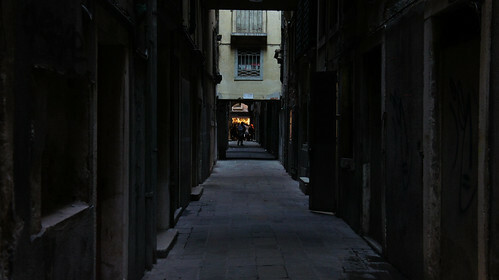 After lunch, back to winding calles and fondamentes as we head for Palazzo Grimani. It’s a bit of a trek through the heart of Sestiere San Marco (skipping the touristy piazza), with a few wrong turns before we find a bridge over Rio Della Fava into Castello district. A few more turns and we emerge onto the sunlit Campo Santa Maria Formosa, from where a Canaletto sign points us to the palace. Besides the Canaletto exhibit the Palazzo’s general collection is an interesting if somewhat sparse mishmash of Venetian and North European masterworks, plus lots of neoclassical frescoes, and rooms for Hieronymous Bosch and Albrecht Dürer. 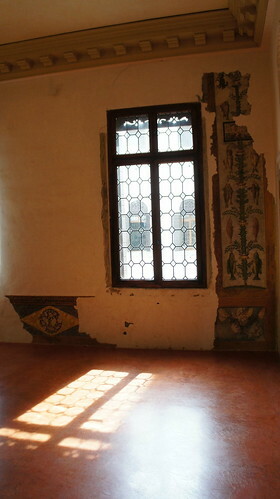 Golden sunlight shines in through windows looking out on the courtyard. A museum guard gently reminds me that photography is not allowed. In the courtyard later on, I watch gondolas glide by the Palazzo’s canalside foyer. On the stone floor of the landing, a dead crab lies upside down, probably beached there by earlier high tides. 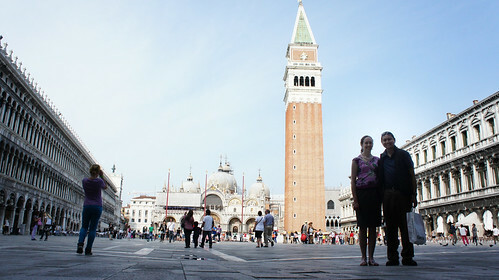 On the way back from the Palazzo we decide to stop by Piazza San Marco for a bit, since it’s on the way. 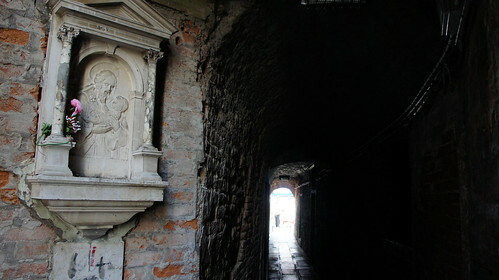 Our point of entry is a dark, moody tunnel lined with shops. Amy ducks into a jewelry store for a bit to get a pendant. Up ahead the light at the end of the tunnel opens into the famous square. Piazza San Marco is, of course, crowded with tourists and pigeons, but not as bad as I expected. 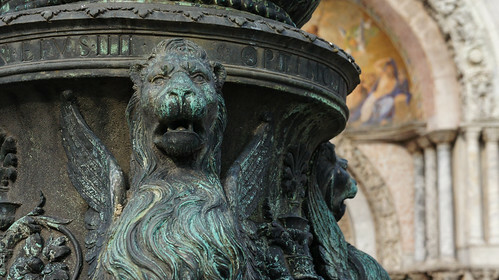 It’s a bit late in the day so we skip entering the basilica or campanile and just take a few photos of the piazza and the bronze lions at the bases of the flagpoles in front of the basilica. Now a moment’s rest in the Giardini ex Reali, a quiet little garden with benches near the piazza, then we get some water bus tickets and hop on the No. 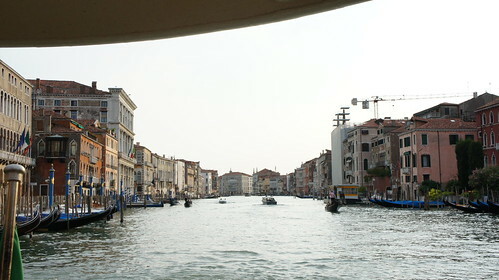 1 vaporetto back down the Grand Canal to Piazzale Roma. 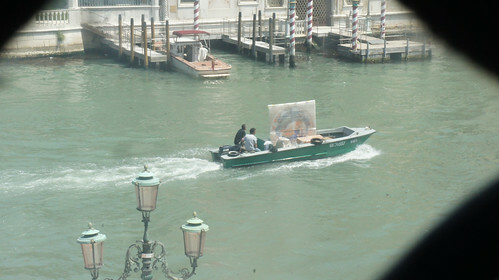 The light is beautiful as we pass by gondolas and under bridges. 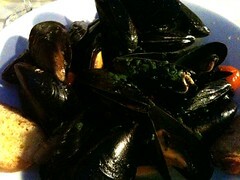 Back at the hotel we try the dinner menu at Ristorante Ribot. I get bigoli with anchovy sauce and a giant bowl of Venetian mussels and it is absolute salty seafood bliss and I want to put olive oil and anchovy sauce on everything forever. Also, through an awkward wine mix-up with the waiter where I accidentally order a bottle of Dolomite wine when I meant to just get the house wine, I learn an important bit of Italian: “Una caraffa del vino blanco della casa, per favore.” The phrase serves me well for the rest of the trip. 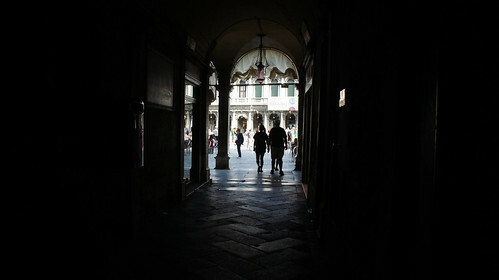 Full Venice photoset on Flickr.